Stuart wears his own hair moderately long, the others wear clerical wigs, with a very slight curl at the edges, and simple in outline. Dissenting ministers abandoned the wig earlier, though Wesley, as still a Church of England clergyman, retained it. Charles Inglis, 1734-1816, born Ireland. Ordained in England. Assistant rector, Trinity Church, New York, 1765. Loyalist in Revolution. 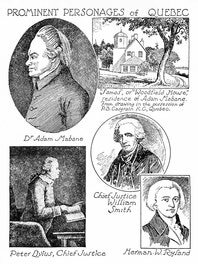 Appointed first bishop of Nova Scotia, 1787. Founded academy at Windsor, N.S., 1788, later King's College. John Stuart, 1740-1811, born Pennsylvania. Originally a Presbyterian, he joined the Church of England and was ordained 1770. Missionary to Indians on Mohawk River. Chaplain to garrison, Kingston, Upper Canada, 1785, and first incumbent of the church there. Jacob Mountain, 1749-1825, born England. 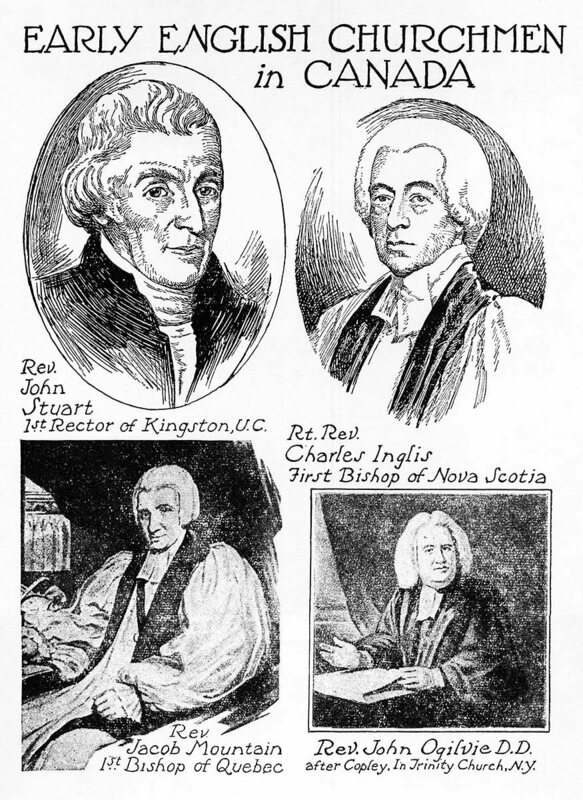 Appointed first Church of England bishop of Quebec, 1793. John Ogilvie, 1723-1774. Missionary to the Mohawks, and minister at Albany. Army chaplain at Ticonderoga, Fort Niagara and Montreal, 1759-1760. Assistant rector of Trinity Church, New York, from 1765 until his death. 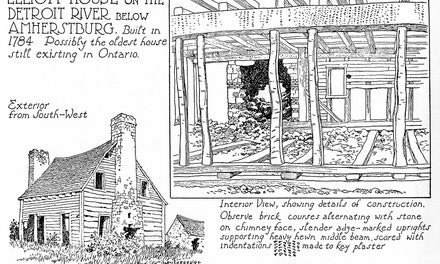 This house, on Lot 5, Malden Township, on the Detroit River, is one of the few surviving buildings of the earliest period of Upper Canada settlement.